Do you ever pose for a good picture only to find out that the moment you were taking your glasses off has been captured that too in a group picture? Or you suddenly took off your glasses just to look good but the whole world is suddenly new and different? Or you are damn tired as you came back from a party and want to sleep immediately, but then you remember that you have contact lenses on! Yes, ah that feeling is so annoying. And the worse part is when you go for an eye test only to find out how bad your eyesight is getting day by day. Nobody likes carrying glasses on their nose and hide their actual features or live with the burden of wearing and removing contact lenses. But somehow we all end up (well at least most of us) getting numbers and are dependent on glasses. But we’ve not yet reached the sad side of the story. The worst part is that we are literally stuck in such a lifestyle that our deteriorating eyesight is its way of rewarding us. Yes, what you are eating is probably not good enough for your eyes. A balanced diet always helps. Instead have oily fish, quinoa, spinach, and citrus fruits as they all contribute to healthy eyesight. Ah this is something we can’t live without. But the truth is that the biggest enemy of our eyesight is technology. As you are reading this while rubbing your eyes generously(after removing your glasses, of course), people with glasses feel like they are in a golden cage. It is really nice here but you can’t get out and it’s making the condition worse. We all know that staring at our computer screens for extended periods can cause damage to our eyes. We all somehow have come across the slogan,’Smoking is injurious to health’ once in a while. But do you know what are the additional benefits of smoking? It causes damage to your eyes as well and increases the risk of age-related macular degeneration, dry eye syndrome, cataract, and other eye-related problems. Now that we know who is the culprit, let us have a look at what crime they have committed to our eyes. And if you are somebody that is a victim of any of the above-mentioned options then book an appointment for an eye vision test today! An eye test is the ultimate way to find out how your eyes are reacting to all the damage that you are doing to it. Well, the list is long. But let’s start by showing you the real picture. Do you know something(Fact) according to NPCBVI main cause of blindness among people in India is Cataract (62.6%), Refractive Error (19.70%), Glaucoma (5.80%), Posterior Segment Disorder (4.70%), Surgical Complication (1.20%, Posterior Capsular Opacification (0.90%), Corneal Blindness (0.90%), Others (4.19%) among people who are 50 years and older. This dangerous sounding disease causes an eye condition where the lens of the eye becomes cloudy. As less light is able to pass through the lens vision blurs. Initially, the cataract is small and may not affect your vision but as it grows it affects the vision more. Sounds scary right? But don’t worry. Where there’s a problem, there’s a solution too. Cataract can be detected through an eye vision test with examinations like Visual acuity test, Slit-lamp examination, and Retinal test. You’ll get prescription glasses but if even that can’t clear your vision, then the surgery is recommended. Timely detection is beneficial. Book an appointment for an eye test today and ensure that you have a healthy vision. Never heard of it? Well, age-related macular degeneration is a condition where the central vision is damaged and then destroyed in two forms wet and dry. 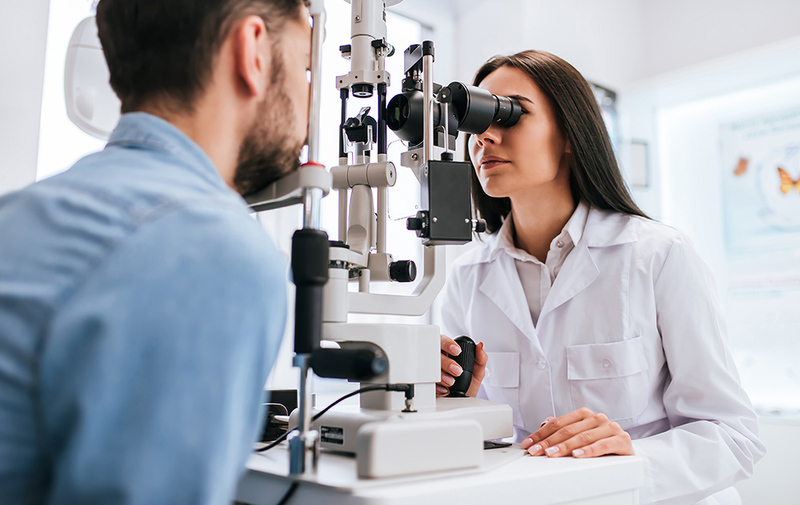 The good news is you can find out about it through regular eye vision test and you know what its early detection helps in treating it and preserving your vision as much as possible. But how to know that you are suffering from this disease? The common symptoms are basically when you see straight lines and they appear distorted, objects that you see are blurry, dark or maybe blurry areas appear in the center of vision. Then you my friend are suffering from AMD if you have difficulty in seeing letters on a page, trouble in seeing at a distance, need more light while reading coloured letters, and have difficulty in detecting contrast. Having one or more than these symptoms doesn’t guarantee that you are suffering from AMD but if you are facing a difficulty in seeing clearly then what are you doing consult your eye doctor now and book an appointment for eye vision test! Yes, an eye test is the first step to fight with AMD. Start acting against your problem today! As if diabetes wasn’t enough that mankind is blessed with Diabetic Retinopathy. And yes you are thinking right! This disease is related to diabetes. You know what this condition causes damage to your retina due to diabetes which can also lead to blindness. If anybody is suffering from diabetes for a long time, they have a chance of developing Diabetic Eye. This form of the disease is best diagnosed with a comprehensive dilated eye test. Laser treatment (photocoagulation), removal of vitreous gel, injections of anti-VEGF (vascular endothelial growth factor) medicine or anti-inflammatory medicines are used to treat the diabetic eye. All these treatments must be put to use before the retina is severely damaged. Things that you can do to control Diabetic Retinopathy is that you can try to shed your love for sweets and keep sugar levels in control by taking a proper diet and stop being lazy and start exercising regularly. You know why regular eye test is important? So that timely detection and its treatment is possible. In the case of Glaucoma, the time plays the villain. You know why? Because Glaucoma is basically the damage of the optic nerve over a period of time. The sad part is that by the time a Glaucoma is detected it has already reached its peak. This condition is the cause of irreversible blindness worldwide. Glaucoma is of two types open-angle and closed-angle. The primary stage of this disease cannot be linked to a specific cause but secondary glaucoma has a direct cause including diabetes, advanced cataract, tumor, and inflammation. Want to know if you have Glaucoma or not? Then just check if you or anybody in your family has these blurred vision, nausea, vomiting, redness and severe pain in the glaucoma eye as these are some of the symptoms. If your vision is not proper and you are having any form of difficulty, go for an eye test immediately. If you are a science student then congratulations but if you are somebody who skips the scientific names of the diseases while reading (like me) then be ready as things are going to get really scientific now! Well, Retinal Detachment is the separation of the retina from the underlying choroid Rhegmatogenous retinal detachment (RRD), Tractional retinal detachment (TRD), Exudative and serous retinal detachments are the three types of Retinal Detachment. And you know what the two symptoms of this eye disease are the loss of vision and blurry vision. Lack of oxygen in the retinal cells is a reason behind this disease. The longer it is untreated, the risk of permanent loss of vision in the affected increases. Early diagnosis and treatment can save vision. A sudden appearance of floaters or sudden flashes of light in the affected eye is also a sign that you are affected with Retinal Detachment. A regular eye test is an ideal solution to keep a check on your eye health. (Fact) According to WHO about 90 percent of the world’s visually impaired people reside in developing countries. The top causes of visual impairment are refractive errors, cataracts, and glaucoma. Which is why Maxivison aims at providing the best eye treatment with the advanced eye test. The world-class facility at Maxivison helps in providing proper and timely treatment with eye test carried out by various eye experts. Regular eye vision test and a healthy lifestyle can help you avoid certain major eye diseases.